Open: Mon. - Fri. 7:00 a.m. - 7:00 p.m. Sat. 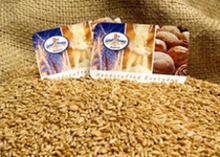 7:00 a.m. - 4:00 p.m.
Our Gift Cards come in any denomination and are accepted at most Great Harvests. Perfect way to be sure they got exactly what they love! 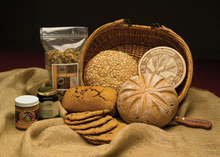 Our most popular combination includes a loaf of Honey Whole Wheat, six giant cookies, and a jar of gourmet jam presented in a gift bag. For times when a nourishing dinner is just the thing to comfort a friend in need. 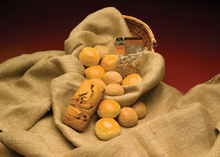 This beautiful basket is filled with a delicious soup mix, a dozen rolls, and a cake bread for dessert. A caring heart is a healthy heart! Encourage both with this beautiful gift. 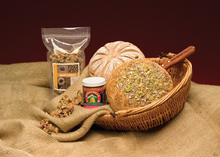 Includes a loaf of Honey Whole Wheat, a specialty Whole Grain Bread, one pound of Granola, gourmet jam and a Great Harvest bread knife. Say thank you in a big way! 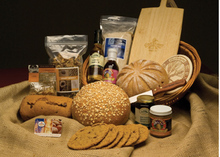 A stunning arrangement featuring a loaf of Honey Whole Wheat, the specialty loaf of the day, the cake bread of the day, six giant cookies, a ceramic bread warmer, one pound of Granola, a jar of gourmet jam, a Great Harvest bread knife. An unforgettable gift! 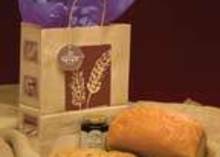 In addition to the contents of the Basket of Gratitude, this basket includes a 100% whole wheat pancake mix, a bottle of flavored syrup, a hardwood breadboard, and a jam spreader. This is a perfect gift to send to an office for lots to enjoy! 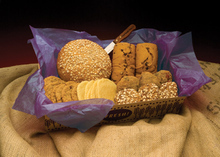 The small includes a loaf of cake bread, the specialty loaf of the day, 4 giant cookies, 3 muffins, and 3 scones. Add 2 more cookies, 3 scones, and 3 more muffins to make it a large.